This is the second of a projected three CDs drawn from Alan Lomax’s 1962 visit to Carriacou, the little island at the south end of the Grenadines, just above Grenada. 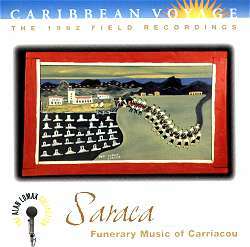 The first, Carriacou Calaloo, (Rounder 1722) is a sampler of the island’s rich and diverse musical culture, while the forthcoming Tombstone Feast will form a companion to the present volume, since both of them are concerned with the rituals and practices associated with death and remembrance. Lomax was aiming to document what he perceived as a ‘common creole style’ underlying the varied musics of Afro-Caribbean communities, and although he cast his net more widely, also making splendid recordings of Trinidadian East Indian music, for example, Carriacou was an exceptionally fertile ground for investigating the interaction of African and European cultures. As Donald Hill writes in the accompanying booklet, ‘Up until the 1970s, most Carriacouans could trace their ancestry to specific African regions and ethnic groups… Mythic identification with an African nation tied groups of families or lineages together in a common ancestry, and this sense of a common African identity served as the glue that held the society together.’ This quotation, and other comments in the booklet, hint at changes in recent years, and if I write here about Carriacouan social organisation and music in the present tense, it’s with an uneasy feeling that satellite TV, tourism, reggae and soca have probably made ‘was’ a more appropriate verb. An important component of this social glue has been reverence for the ‘Old Parents,’ the Eighteenth Century ancestors who constructed the social order which has sustained Carriacouans through slavery, and then through the migrant labour system which has been an economic necessity since Emancipation. The more recent dead are also continuing participants in the world of the living, appearing in dreams and asking for special food - the Saraca (feast) which gives the CD its title - and for entertainment, in the shape of the Big Drum dance, hymns and other music, and folktales. The ancestors also give advice to the living in dreams. Accordingly, funeral rites, and other rituals associated with death, play an important part in helping the dead to make the transition from this world to the next, and in encouraging them to return and help the living. Carriacouan society thus implicitly rejects notions of the social contract, since only a living person can make a contract. Instead primary weight and power are granted to the wisdom which accumulates from the collective experience of history, and tradition is to be consulted first when decisions have to be made. I expect that this system is also an effective way of imposing limits, of defining what may not be done as well, as what may and must be done, but if so, it’s no different from many another social order developed to hold a fragile community together. Donald Hill’s notes, based on his 1971 research, state that after the wake and the burial (which have numerous necessary rituals and procedures of their own, in addition to those of orthodox Christianity), the close relatives of the dead are obliged to make a Saraca in the deceased’s bedroom on any or all of the Third, Nine and Forty Nights (ie the third, ninth and fortieth nights after death), and to hold a prayer meeting or Big Drum dance on at least one of them. In practice, when the prayer meeting is held, and indeed whether one or more of the Nights takes place, depends on ‘whether money was available, when relatives would arrive from abroad, who was available to help, and the time of year,’ with the Nine Night being most common. Hill gives a detailed account of a Nine Night he attended; briefly, the event involves the singing of hymns and later the livelier anthems of the Spiritual Baptists, the drinking of 180 proof jack rum, conversation, cards, dominos, and the distribution of food. In former days, Nancy stories were told from about 11 pm, but this was rare even in 1962. The importance of these events in binding together the community - including those relatives who have emigrated, and returned for the occasion - is obvious. Also present, of course, is the dead person, whose finest clothes are laid out in his or her room to wear when the returning spirit partakes of the food laid out on the Parents’ Plate. Thereafter, the memory of the departed must be honoured each year (with the method - Mass, Parents’ Plate, prayer meeting or Big Drum - often specified by the deceased in a dream visitation), until funds allow for the erection of a gravestone, when the Tombstone Feast is held. This is a splendid compilation of recordings, made when great Carriacouan musicians like Sugar Adams (who was also a grave digger, and thus doubly in touch with the spirit world) and his companion, May Fortune, were still making great music. The tradition continues in the hands of such as Lucien Duncan, heard as a young woman in this disc’s Big Drum choruses, and now May Fortune’s successor as Carriacou’s best Big Drum dancer and singer; but we must be grateful that Alan Lomax’s bloodhound instinct for where things were happening musically resulted in the making of these remarkable sound documents. Virtually all of them are issued here for the first time, nearly 40 years after they were made. That’s too long a wait, but at least it’s now over.